Mary Gothard (later Mary Yarrow) was the third of the nine children of William Gothard and his wife Sarah Hawkins of Witcham, Cambridgeshire, England. 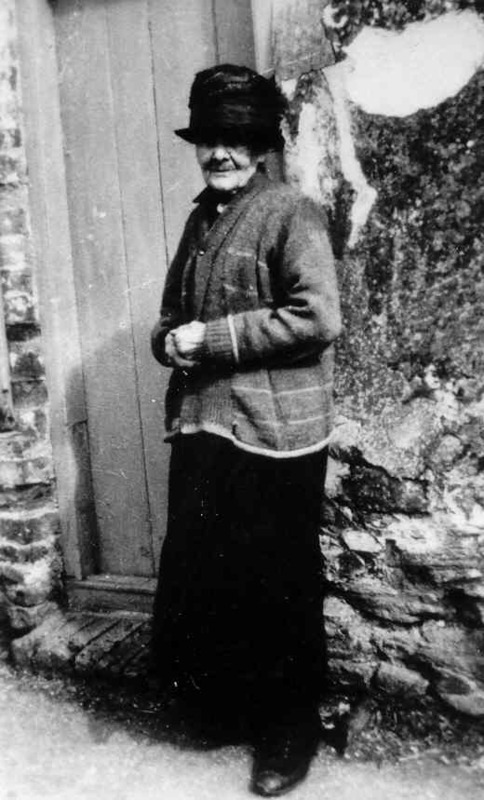 Above: Mary Yarrow (née Gothard) outside her home in Little Thetford, pre.1930. Photo: Andrew Martin. Mary worked as a Domestic Servant, and for a time in the 1860's she worked at "The Three Horseshoes" public house in Little Thetford, Cambridgeshire, which was owned at the time by Owen Yarrow. It was during this time that she would have met her future husband, Owen Yarrow's half-brother, James Yarrow. The pub has since been converted into a large house. The couple married and had three sons, and they set up home in a cottage owned by a Mrs. Lister, just opposite the pub. James died in late October 1930 and Mary, a distraught widow, went to live with her son James at nearby Wilburton Station. Sadly, whilst she was away, her cottage caught fire on 5th November 1930 (Guy Fawke's Night). The Ely Fire Brigade attended the fire and villagers helped to rescue the furniture, but the house was burnt to the ground. It is believed that a stray firework landed on the thatch of the cottage. Mary died about three months later, which together with the death of her husband was claimed by The Cambridgeshire Times as having "hastened her end". 1847 at Witcham, Cambridgeshire, England. 1st August 1847, with brother Richard Gothard and sister Hannah Gothard at St. Martin's Church, Witcham, Cambridgeshire, England. James Yarrow (1846-1930) on 10th November 1868 at St. George's Church, Little Thetford, Cambridgeshire, England. 1851: 4yrs, Slade, Witcham, Cambridgeshire, England. 1861: 14yrs, The Three Horseshoes Public House, Little Thetford, Cambridgeshire, England. 1871: 24yrs, Principal Street, Little Thetford, Cambridgeshire, England. 1881: 34yrs, Front Street, Little Thetford, Cambridgeshire, England. 1891: 44yrs, Front Street, Little Thetford, Cambridgeshire, England. 1901: 54yrs, Front Street, Little Thetford, Cambridgeshire, England. 1911: 64yrs, Round House, Little Thetford, Cambridgeshire, England. 14th February 1931 in Little Thetford, Cambridgeshire, England. 18th February 1931 at Little Thetford, Cambridgeshire, England.